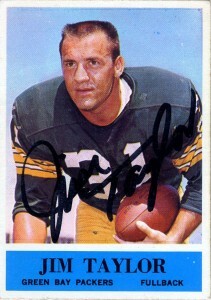 One of the best rushing fullbacks in the NFL’s history before the AFL merger, Jim Taylor was drafted in 1958 by the Green Bay Packers after winning the MVP honors of the NCAA Senior Bowl. Jim would be overshadowed by teammates Bart Starr and Jim Hornug, and NFL rushing champion Jim Brown, but Taylor would win the rushing record in 1962 -the only season Jim Brown failed to. Taylor was a winner of the NFL championship in 1961 and 1962. He’d later score the first rushing touchdown in SuperBowl I enroute to the team’s victory over the Kansas City Chiefs. A 6 time All Pro selection and 5 time Pro Bowl selection, Jim was a member of the 1960s All Decade team. Taylor was also a durable, brutal hitter, who was quite effective out of the backfield on swing passes (and made 1,000 yard seasons on a 14 game schedule regularly).In his final season in the league in 1967 he’d be traded to the expansion New Orleans Saints – retiring at season’s end. Jim was inducted into the Pro Football Hall of Fame in 1976 and his most outstanding memory of playing was being named the league MVP in 1962. Taylor has also been inducted into the Wisconsin and Packers HoF. Recently Jim was named the best player in NFL history to wear the #31. Josh and I drove downtown to the Austin Convention Center where there was a card show where Taylor was at. We were two of the first people there and Jim gave me a big handshake where he almost crushed my fingers. Taylor was selected by the Green Bay Packers to announce their 2nd round draft choice in 2011. UPDATE: 10/13/18- Jim Taylor passed away early on Saturday morning at the age of 83.